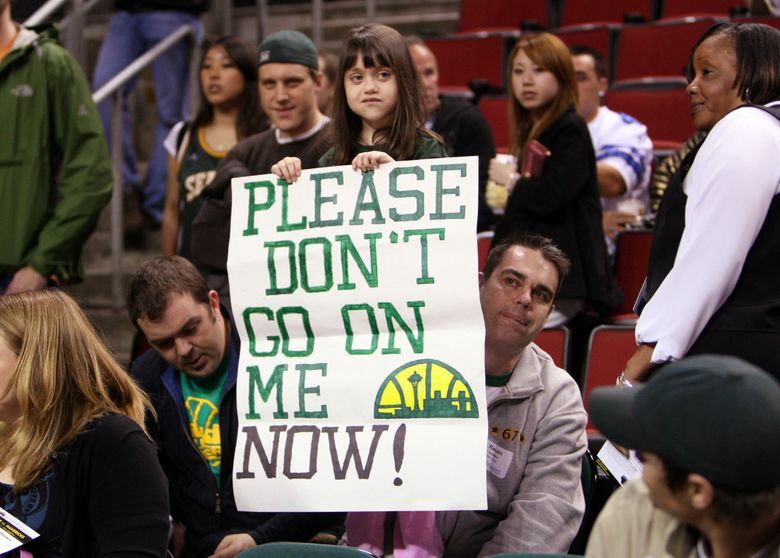 Ten years ago Monday, the Sonics' 41-year run in Seattle came to abrupt close, leaving hoops fans in town broken-hearted and searching for answers. They say time heals all wounds. For Sonics fans, that couldn’t be further from the truth. Just hours before U.S. District Judge Marsha Pechman was supposed to issue a ruling over whether the Sonics would leave immediately or finish out the remaining two years on their lease, then-Sonics owner and current Thunder owner Clay Bennett and then-mayor Greg Nickels called simultaneous news conferences to announce a settlement that would allow Bennett to take the team to Oklahoma City. 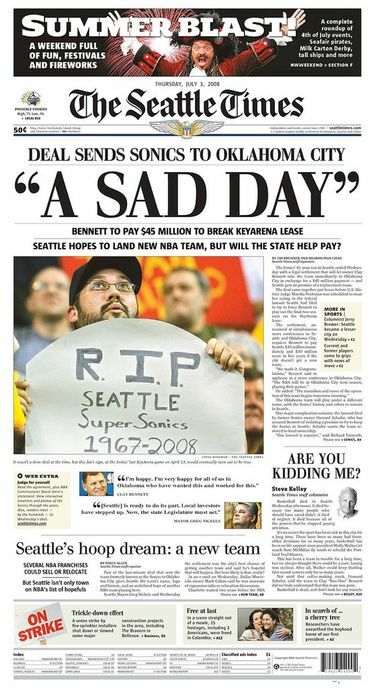 The front page of The Seattle Times on Thursday, July 3, 2008. The deal offered no guarantee for the NBA’s return to the city and allowed Bennett to also take the team’s banners, 1979 championship trophy and six retired jerseys. Oh, and he also took a lanky scoring machine named Kevin Durant, fresh off a Rookie of the Year season, and another guard from UCLA named Russell Westbrook, drafted weeks before the announcement. 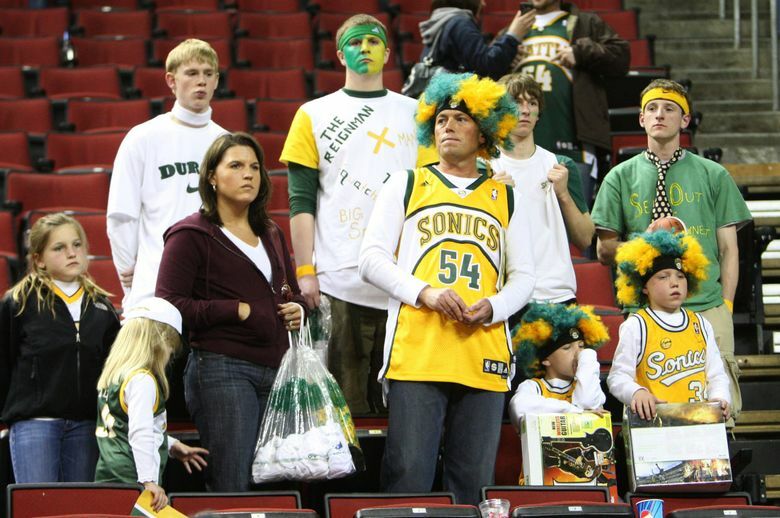 It was the final twist of a knife at the end of a long, painful process for Sonics fans, beginning in October 2006 when then-owner Howard Schultz sold the team to Bennett. Ten years later, those memories linger. Durant and Westbrook both now have league MVP trophies on their shelves, and Durant has won the past two NBA Finals. The Thunder has reached the playoffs in each of its eight years of existence — although Oklahoma City has yet to claim a title of its own. And though the NBA continues to thrive and grab headlines, many NBA junkies in Seattle have abandoned the league. Without the Sonics’ green and yellow, it’s just not the same. The NBA is expected to eventually come back to the Emerald City. 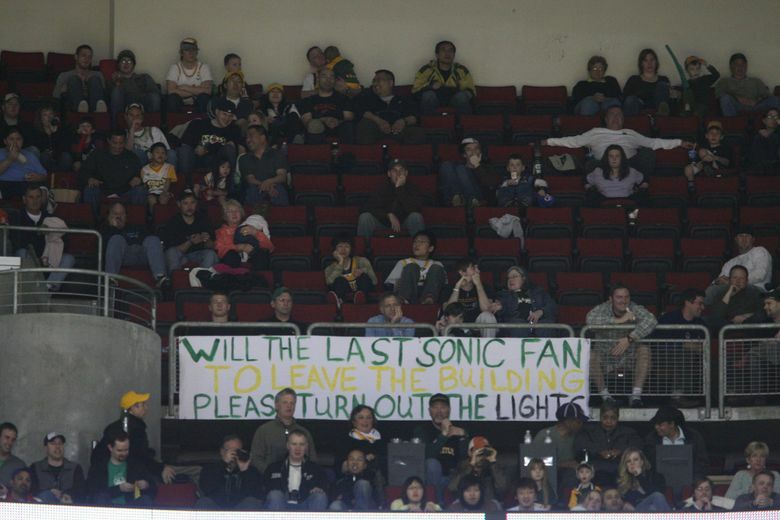 With plans for a KeyArena renovation in the works, the return of the Sonics seems much easier to grasp now than a decade ago. But winters in the Northwest without the Sonics have been more bleak the past 10 years.